Love puddings. This one is so quick and easy to make. No cooking and easy to tweak to fit your taste buds. Plus, it’s terrific as an anytime energy boost. 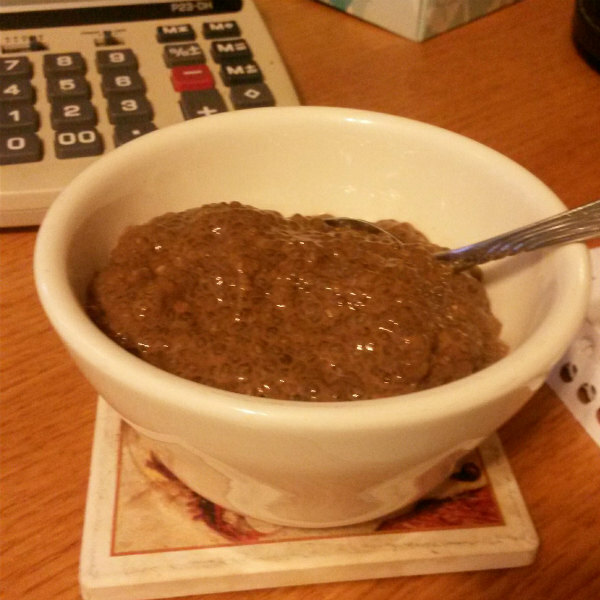 It’s my tweak to a Chia Seed Pudding recipe I discovered on Katrina Mayer’s site. I admit to serving this with homemade whipped cream. Now that does up the calories (for those counting) but all the nutritional value of chia seeds, and the other great ingredients, remains. Place ingredients in jar or bowl and mix well. 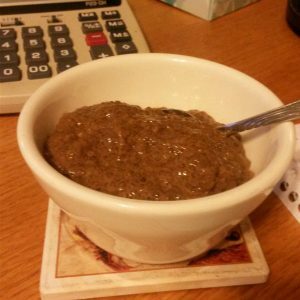 Let stand at least 10 minutes or overnight to allow chia seeds to “gel” and thicken the pudding. This holds well for up to a week or so. Great for breakfast, snack, or dessert. Can serve with fresh fruit, chopped nuts, and other goodies. It’s up to you. ** Adjust stevia to taste. — Can substitute another sweetener, like maple syrup, brown sugar, or even table sugar. You can find Katrina’s original recipe here. The vanilla bean powder I made myself (recipe here). I use a lot of chia seeds so usually buy it in bulk from Amazon. Also bought the raw cacao on Amazon, as well. The stevia I can easily find locally. I don’t go through much so tend to buy smaller boxes of packets which I find more convenient. Last time I bought it at my little local IGA store on sale. But it’s easily found on Amazon, too. Please note: Some of the products I recommend include affiliate links. It doesn’t affect the price you may pay if you buy from that link. It just means that I might get a small commission if you do, which I use to help pay for the cost of maintaining my websites and running my business. That sounds awesome, any suggestions for not using any type of sugar at all? Guess you could whip coconut milk to use as whipped cream too. Definitely want to try this out. Thanks. Hi Sue. If you make the vanilla variety you could leave out the sugar. Raw cacao is very bitter so I actually use more stevia in this recipe than I normally would. Also, if you serve vanilla bean chia seed pudding with a naturally sweet fruit, like ripe berries or peaches, you might like it enough to forego the sugar. Haven’t tried it, but I’m wondering if adding a dollop of yogurt might also be a good substitute for the sugar. BTW, this pudding is very rich tasting. Just a teaspoon or two is very satisfying so a “serving” for me doesn’t include much sugar at all. So glad you mentioned coconut whipped cream. Yes! And it’s so good and easy to make. Won’t hold up as well as traditional whipped cream but definitely delicious on many foods. Will give the vanilla version a try and add some berries to it. Going to be our Valentine’s treat. Sounds lovely! Be sure to let me know how that turns out. That sounds interesting, I’ve never cooked with chia seeds before. Must give it a try! This recipe is especially easy since there’s no cooking. Hope you come back and tell us your results…and whether you liked it or not. Nice post Kat! I am a big Chocolate fan and I am sure I will like this pudding as well! Hey there, Edward. Welcome back. I love most types of chocolate. But it took me a while to adjust to raw cacao because it can be so bitter. Be sure to take that into consideration when trying this recipe.